Les Schirato is an inspiring entrepreneur who has played a major role in shaping the coffee industry in Australia. It's his entrepreneurial flair that has seen him awarded with a number of accolades such as Entrepreneur of the Year in 2001. 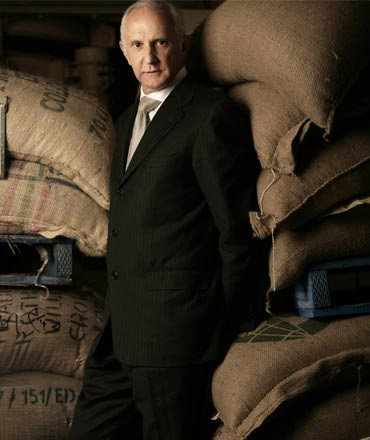 Widely known as Australia's 'Coffee King', Les Schirato is the man behind the success of Vittoria Coffee – Australian's No1 pure coffee company*. Les commenced full time employment at Cantarella Bros (Trading as Vittoria Food & Beverage) in 1972 and was appointed Group Managing Director in 1993. Today, Les and his family are the company owners. Les' unprecedented success in achieving consistent sales growth in the highly competitive pure coffee market is no accident. His energy, drive and passion over a career spanning almost 30 years combined with his sales and marketing expertise has heralded an explosion in the popularity of espresso coffee in Australia. An industry leader, Les served as President of the Australian Coffee and Tea Association and is now an honorary life member. He is also a member of the World President Organisation (WPO), of which he is the Chair of the WPO Sydney Chapter. In 2009 Woolworths named Cantarella Bros as the Woolworths Supplier of the Year. In 2008 the Italian Chamber of Commerce awarded Cantarella Bros with the Business Excellence Award in the category of Food, Wine and Beverage. In 2006 Vittoria Coffee was awarded the prestigious "Supplier of the Year Award" – restaurant and Catering NSW /ACT Metropolitan Awards. As an industry voted award, Les' contribution to Australia's food and coffee culture was recognised. In 2004 Vittoria Coffee was awarded first place in the Innovation category by the Australian Marketing Institute Awards, for the 'Café at Home' pure coffee aisle activation project executed nationally throughout Woolworths supermarkets. In 2004 Cantarella Bros was awarded the Australian Family Business of the Year – 2nd Generation Winner for successfully introducing Australians to their now well-known coffee culture. In 2002 at the National Business GIO Star Awards, Vittoria Coffee was awarded with GIO's fastest growing business award. In 2017, Les Schirato was awarded a Knighthood of the Order of Merit by Decree of the French President for his work between Australia and France in the area of trade and tourism. In 2016 Les Schirato was awarded the United Nations Association of Australia (UNAA) Lifework Individual Award for his contributions to the Australian coffee industry and the Food & Beverage industry at large. For services to the community and philanthropic contributions to health, youth, rural areas, social welfare and those less fortunate. For investing time and mentoring of youth in business and talent. In 2013 Les Schirato was inducted into the Italian Chamber of Commerce as well as the Industry's Hall of Fame. This honour was in recognition of his outstanding career and cultural achievements to date. In 2013 Les Schirato was announced as an ambassador for the Italian Chamber for Commerce. In 2008 Les Schirato was honoured with the CIRA Award, for his outstanding contribution to Italian Culinary Culture. In 2004 Les Schirato awarded Family Business Australia Business of the Year – Second Generation. In 2004 Les Schirato awarded Australian Marketing Institute Innovation Award. In 2004 Les Schirato awarded Multicultural Marketing Big Business Award. In 2002 Les Schirato awarded GIO National Business Star Awards – fastest Growth Award. In 2001 Les Schirato was named Ernst & Young Entrepreneur of the Year (consumer and industrial goods). In 1998 Les Schirato was awarded the Paul Harris Medal by the Belrose Rotary Club for Vittoria's ongoing help given to Camp Quality children's cancer charity. Honoured with the CIRA Award, for his outstanding contribution to Italian Culinary Culture. Les' passion and his service to the community through philanthropic contributions to health, youth, social welfare organisations and to business was recognised with him being awarded a member of the Order of Australia (AM) in 2008.